What comes to mind when I am asked about Mt. Irid is not the numerous river crossings nor its monolith summit; rather the infestation of leeches or the local limatiks. These bloodsuckers literally abound and made their presence felt during our trek to the Sitio Sadlac base camp. An Irid adventure begins with a two-hour jeepney ride from Cogeo, Rizal to Sta. Inez in Tanay. Remote and with really bad roads, the trip to Sta. Inez was mostly bumpy with the jeep rumbling through lots of river crossings. Once there, the jeep will drop you off at the barangay hall where you will register and pay the barangay captain a courtesy visit. The first day takes mountaineers to Sitio Kinabuan and Sitio Sadlac. The locals in Sitio Kinabuan are more familiar with the trail to Mt. Irid. On top of the guides secured from Sta. Inez, a guide from Sitio Kinabuan will also be hired. The base camp is at Sitio Sadlac. There is a modest bunker in the sitio where mountaineers spend the night before the morning trek to Mt. Irid. 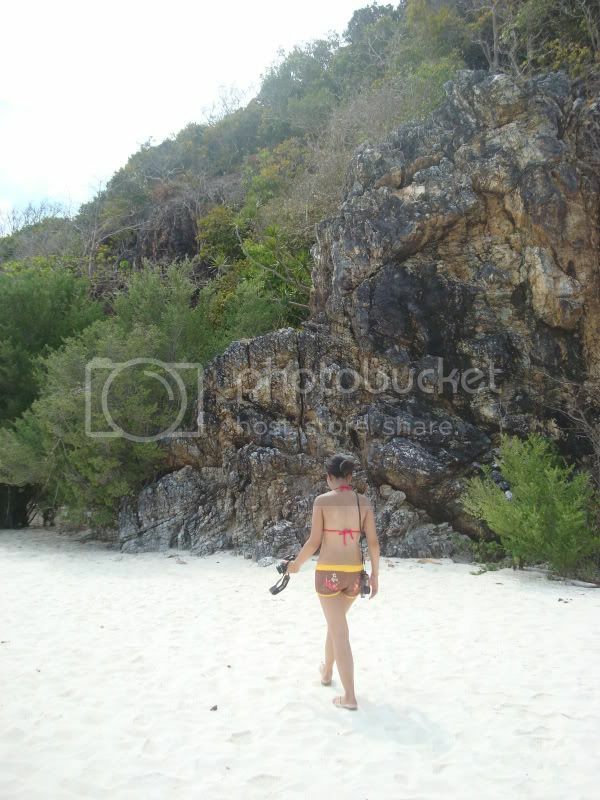 The trek to the sitios begins with an easy walk on wide trails. It has a gradual incline and has more than ten river crossings (I personally stopped counting after 10). Depending on the season, mountaineers may need to go through waist-deep levels. The tributaries are wide and extra caution must be taken in all crossings. During the wet months, limatiks infest the trails. By the riverbed, after going through the river and by the rocky paths, the leeches are likely to be found clinging on your shoes and pant legs. The next day, the real climb to Mt. Irid begins. The trail was for the most part an ascent. The paths are lined with dense vegetation. The trees were towering with moss, roots and vines hanging off them. Limatiks are not as present in this portion of the climb as it was in the ascent to the base camp. As the summit is approached, there are rock walls and portions where going through and over the big rocks are encountered. At the final section of the assault, the jagged sharp rocks of the summit is reached. A plastic sign marks the peak of that part of the Sierra Madre range. 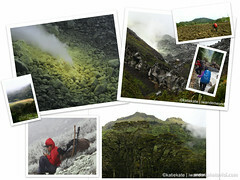 Rising at 1,157 MASL, Mt. 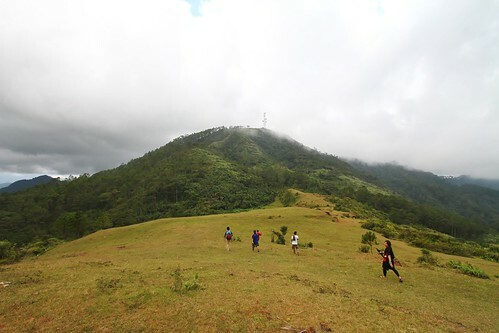 Malindig is the highest peak in the province of Marinduque. A quick and easy hike, it starts with a level trek through the locals’ backyards and a field of coconut trees. Next is a mild ascent through the pasture lands. 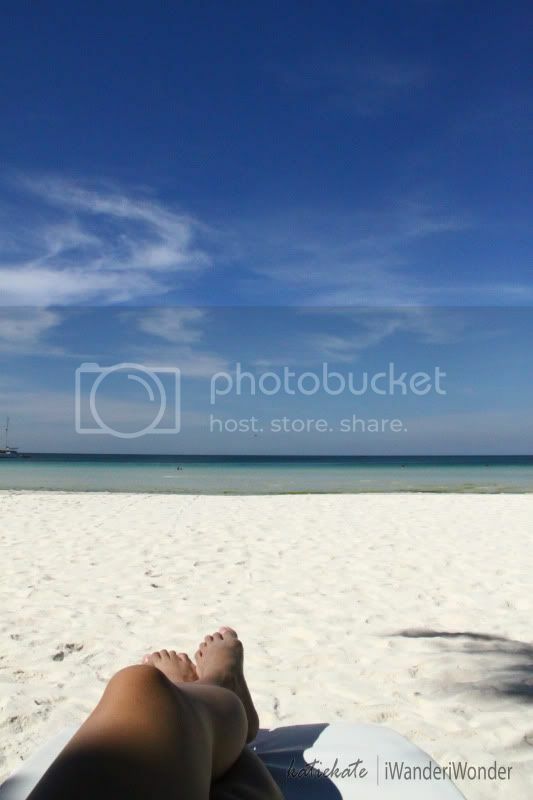 Without any tree cover, it becomes cumbersome in the midday to midafternoon heat. Aside from the cows grazing idly by the trail, hikers would also need to watch out for the itchy “lipa” plants (and trees). A little stream is crossed before going up to cogon-lined trails leading to the military outpost. Hikers enter the forest line after the brief stop and courtesy visit at the outpost. Felled trees and mossy roots adorn most part of the trail. 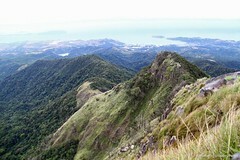 After about a half of an hour ascent, the summit of Malindig is reached. Heavily covered by trees, there is no view of the neighboring towns and islands from the peak. 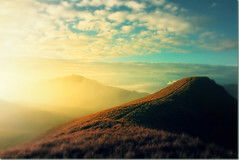 Rather, there is a campsite at the summit where at most ten (10) tents can be set up. In slippers and wearing minimal sun protection, we had a quick trek to Lake Danum traversing to a hike to Mt. Ampacao (1,889 MASL) during our Sagada trip. Easily accessible by foot from the town center, we started by registering at the Sagada Municipal Hall and getting a local guide (Php600.00). The trek to Lake Danum was a breeze. You pass through concrete pavements leading to Besao which eventually becomes a dirt path. Lake Danum is a gem in the middle of the mountain town where picnics and camping overnight are allowed. The traverse to Mt. Ampacao starts from a partially obscure offshoot from the main trail. The weather is cool and pine trees dot the single path. It winds through the hills and offers a view of the town center along certain portions of the trail. 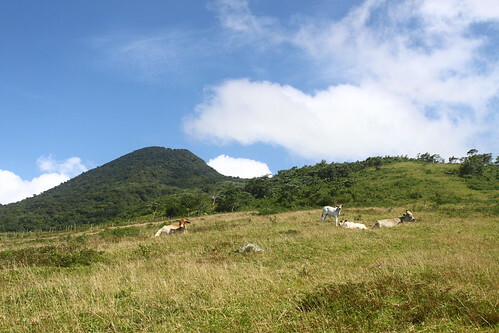 After about half an hour, you reach a grassland called the “ranch”. 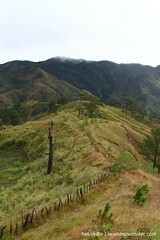 At the “ranch”, cows graze and you get a panoramic view of Sagada and its neighboring towns. Twenty minutes from the grassland, a cellphone tower marks the summit of Mt. Ampacao. 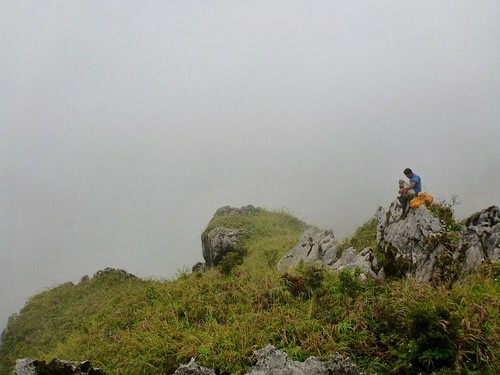 This is the highest point of Sagada, Mt. Province. I will give it to you straight. Steep. Yes she had fabulous views at the peak, refreshing river crossings and the thundering drop of Ubod Falls, but, what stuck to me about Damas is her killer ascents and knee-busting descents. The guides may insist the slopes are gradual, but they are not. With the jumpoff being at an elevation almost as high as the mountain’s peak (685+ MASL), the trail starts with an almost one hour sharp descent through slightly covered grass paths leading to a river crossing. It then progresses to a two-hour ascent all the way to the summit. There are two saddle campsites and one at the summit itself. Each area can comfortably hold about five to eight tents. The views at either of the campsites offer clear sights of neighboring mountains (like Tapulao and Arayat) and the Tarlac terrain. 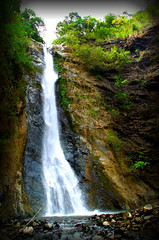 The traverse to Ubod Falls takes an average of three to four hours through more cogon-lined paths and steep trails. There are a number of roped segments to make the way down and up easier. Fifteen minutes away from the 100-foot Ubod Falls, you will pass by a smaller one through which you will have to negotiate the final roped segment. So there we were, at the peak, shivering from head to foot in the cold mountain air and rainfall. Ah, Mt. 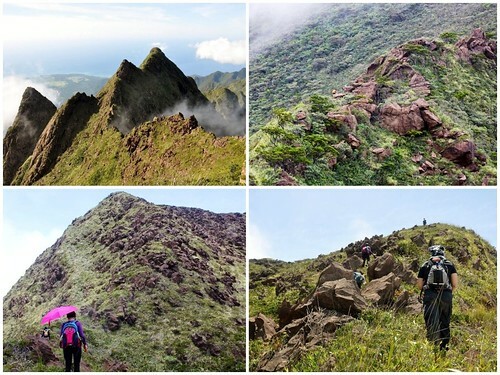 Apo – indeed the grandfather of all Philippine mountains (2,956 MASL) . Halfway into conquering him, we have already had our fair share of shifting landscapes and contrasting trail types. As nighttime bade hello, we set down our full packs and quickly assembled our tent amidst the biting wind. Good thing we had the entire peak to ourselves. We settled for a spot inside a shallow cave and hoped the tent can take the battering of the winds. Our gracious host and guide Jezer Paro* (+63 918 7819861) is nothing short of amazing. Contacted at the eleventh hour, we were fortunate he was available and agreeable to our 2-day traverse of the Kapatagan (Davao) and Kidapawan (North Cotabato) trails. His suggested plan was to start at the Kapatagan side and climb all the way to the summit on the first day, make camp at the summit area and descend to Lake Venado and the Kidapawan trail the next day. Whereas the usual itinerary takes three or four days for the entire traverse, we opted to challenge ourselves to finish it overnight. Jezer knew the ins, outs and shortcuts of the mountain by heart. With all his tricks, we were able to cut short our ascent by an hour or two. We negotiated the ascent for a total of seven hours and 25 minutes and the descent for a staggering seven and 15.